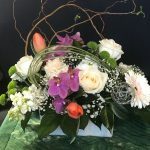 Beautiful Roses Floral Design, located in New Westminster, British Columbia, offers hand-made high quality floral arrangements and design services for all occasions. Orders are based on stock availability. A similar substitution will be used without prior notice. The full satisfaction is our concern and promise to our client.